Description: Ascending or erect annual to 0.5 m high; culms geniculate at the base, branched. Leaves with sheath loose, overlapping, glabrous or bearded with a few hairs at the orifice; blade flat, short, erect, 2–3 mm wide. Inflorescence of 3–5 erect or spreading spikes, 3–5 cm long. 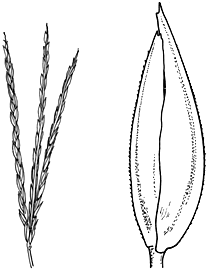 Spikelets 1-flowered, 3–5 mm long. Glumes acute or mucronate, laterally compressed, 3.5 mm long. Lemma acute, 2–2.5 mm long, elliptic, laterally compressed, densely ciliate on the margins and midnerve. Palea ciliate on the nerves. Distribution and occurrence: Usually grows in open areas subject to infrequent flooding.